We are proud to be a Community Partner of EVOKE: A Festival of Diverse Voices. 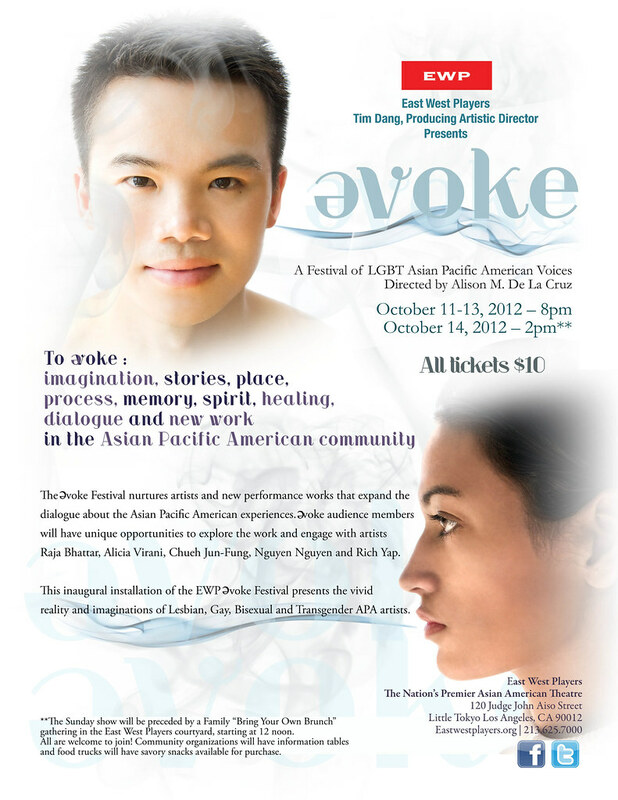 EVOKE will take place October 11-14, 2012 at East West Players in Little Tokyo, Los Angeles. The EVOKE Festival nurtures artists and new performance works that expand the dialogue about the Asian Pacific American experiences. This inaugural installation of the EWP EVOKE Festival presents the vivid reality and imaginations of Lesbian, Gay, Bisexual and Transgender APA artists. EVOKE audience members will have unique opportunities to explore the work and engage with artists Raja Bhattar, Alicia Virani, Chueh Jun-Fung, Nguyen Nguyen and Rich Yap. EVOKE is directed by multi-disciplinary theatre artist Alison De La Cruz.